A great way to save time and be more productive while writing on your computer is to use special apps that have been created for writers. If you haven’t used one before, you certainly should try it. There are many simple writing apps for your iPhone that will help you make more creative stories, give you inspiration, help with every part of your writing process. How to find the best app for this purpose? We have for you one writing inspirational app – Inspire the Fire. Let’s discuss about it. What is Inspire the Fire exactly? 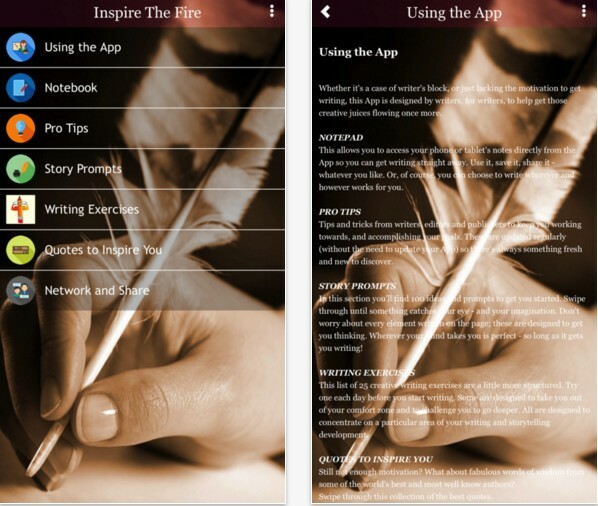 Inspire the Fire is an app created especially for writers and developed on IOS platform. This app helps every writer that writes professionally or as a hobby, to get inspirational ideas and motivation for their writing process, helping them work on every area of their storytelling and writing skills. The app challenges the users to push themselves and get their writing skill on a high level. Easy to use and simple, this app is created from proven writers to help other writers enjoy the writing process and reach new levels of writing. Amazing app that is certainly a great tool for every writer that needs to improve their writing skills. The app offers the writers to choose from 100 writing prompts and 25 writing exercises, helping them to develop new ideas and motivate themselves to create the best stories. The prompts and exercises are focusing on specific writing areas, helping the writers to completely improve and develop their skills. With swiping through the quotes catalogue, the users can find many popular quotes written from the most famous authors. The app has the integrated notepad-app, giving the users the option to start writing when they want. Also, this app offers the users pro-tips that are constantly updated to help the writers keep track with the latest changes in the industry, learning about popular authors, publishers, and editors in the moment. You can also share your stories and writings on the app with other users. Download it on App Store now!